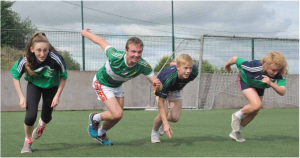 Students have access to a full size GAA pitch as well as a large All-Weather Astro-turf pitch, which is in full use by our students up to 6pm each day and every lunch break. 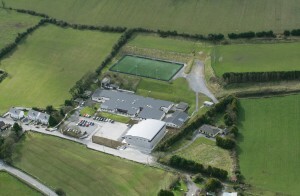 Scoil Ruáin has two modern Science Laboratories, and one large Science Demonstration room. All of these rooms are well stocked with the most up-to-date equipment. Our warm, welcoming and well-stocked library is a haven for our students to come and lose themselves in our large collections of books, magazines, journals and newspapers. Our librarian is on hand to assist students in choosing suitable reading material and to co-ordinate activities, such as World Book Day celebrations and Creative Writing competitions. The extensive reference section and computers with internet access provide invaluable support for students in their study, research and project work. At Scoil Ruáin we aim to provide high standard information and technology services and support to students. Students have state of the art computing facilities, which enable the provision of a specific IT syllabus to Junior Cycle students in particular. 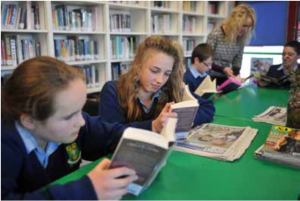 Scoil Ruáin has access to 100MB Hi-Speed broadband connectivity and all classrooms are equipped with data projectors and PCs to facilitate the use of ICT in teaching and learning. The iPad initiative is further enhanced by the provision of Apple TV in many classrooms. 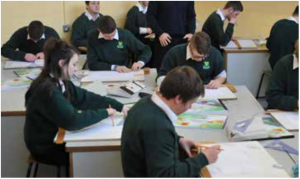 Scoil Ruáin is equipped with up-to-date specialist rooms for the teaching of Materials Technology Wood, Materials Technology Metal, Art, Music, Home Economics, Technical Graphics, Design and Communications Graphics and Computer Studies. Scoil Ruáin has a modern, state of the art, indoor sports facility. 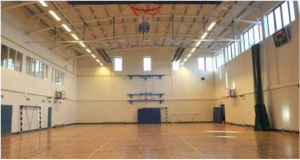 Here, students have access to a fully equipped gym and full size basketball court where badminton, volleyball and table tenins can also be played. This facility allows students to continue to achieve their full potential in the challenging and competitive sporting world of today. It is used on a daily basis by all of our sports teams and physical education classes. The sports on offer here include basketball, indoor soccer, indoor hurling, badminton, volleyball and table tennis.